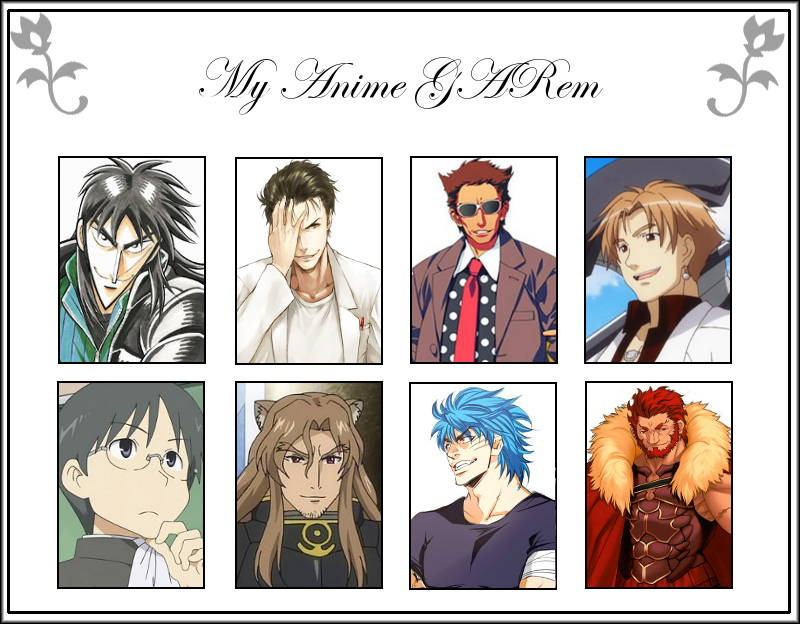 And as is equally traditional, I present my anime GARem of 2012! Well, I’m home. Still going to bed at 3 AM, but unfortunately the freedom of being able to sleep in as long as I want has been taken away from me. They always find an excuse to wake me up. I’ve also been subjected to 12 inches of snow, power cuts, poor central heating and the slowest internet speeds since dial up. All I hope is that I can make a quick escape early in the new year, I DO NOT want to be stranded here due to the snow. But complaints aside, at least I’m being forced to eat! 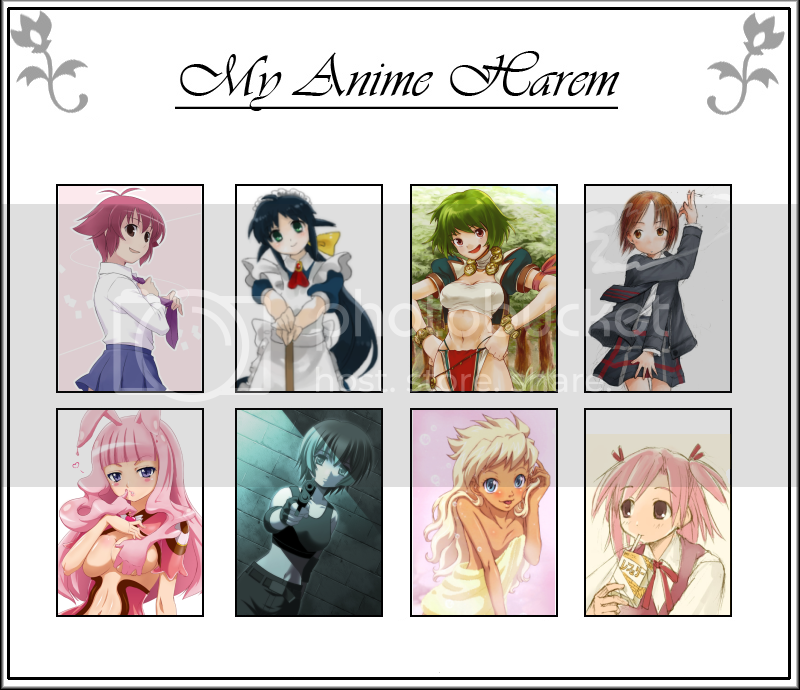 From the top left – bottom right: Kinoshita Hideyoshi (BakaTest), Miyako (Hidamari Sketch), Batai/Tanpopo (Shin Koihime Musou), Togame (Katanagatari), Merona (Queen’s Blade), Ritos Tortilla (Shukufuku no Campanella), Stocking (PSG), Soga Keena (Ichiban Ushiro no Daimaou). 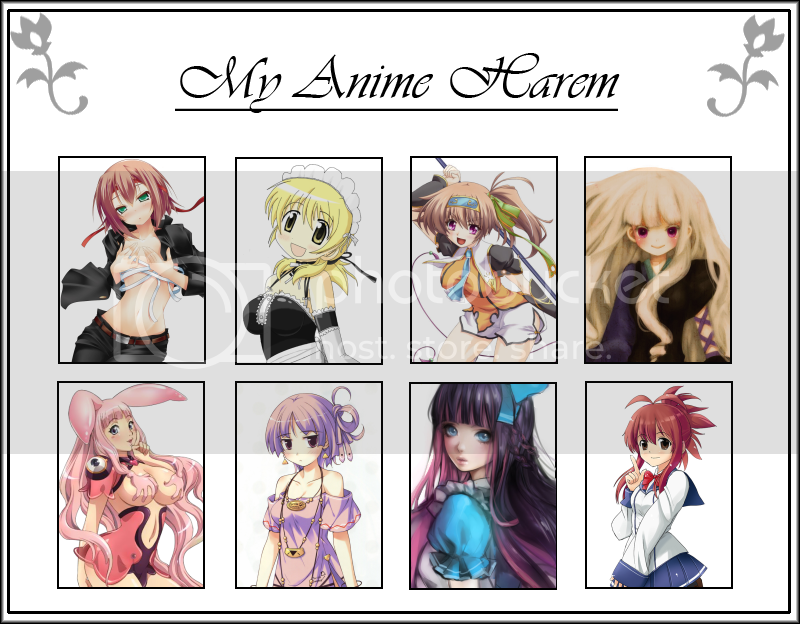 These are the (mostly) female characters that sum up this year’s anime for me. Apart from Merona, who’s more of a 2009 character, but she qualifies due to the current ongoing Utsukushiki Toushi-tachi OVAs. It’s nice to have some overlap, afterall! 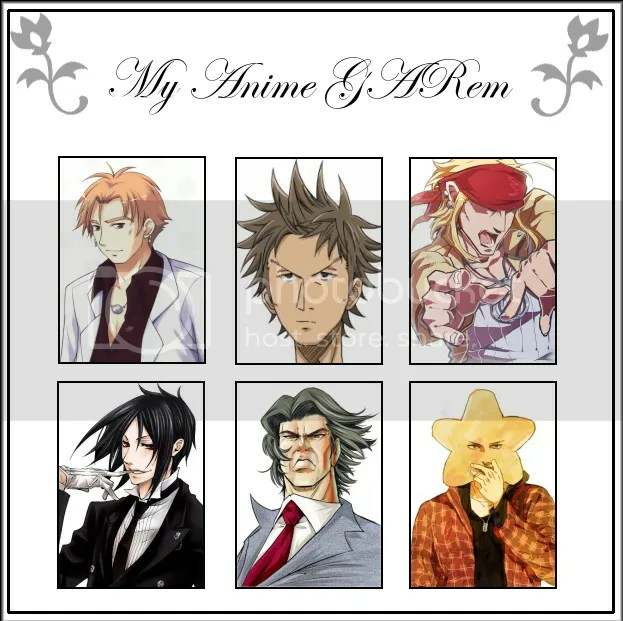 In order to get into my harem, character design is of course important, but so is personality. I’m not sure I’d be able to live with some (let alone all) of them in real life, admittedly, but on screen they’re a lot of fun. Unlike my theme posts, I can look at this list and say my choices aren’t biased in favour of more recent seasons. But this even spread didn’t happen deliberately, I only realized after I finished and looked at them all together. I guess my likes in terms of characters are more consistent than my changing tastes in music, which has got to be a good thing, right? 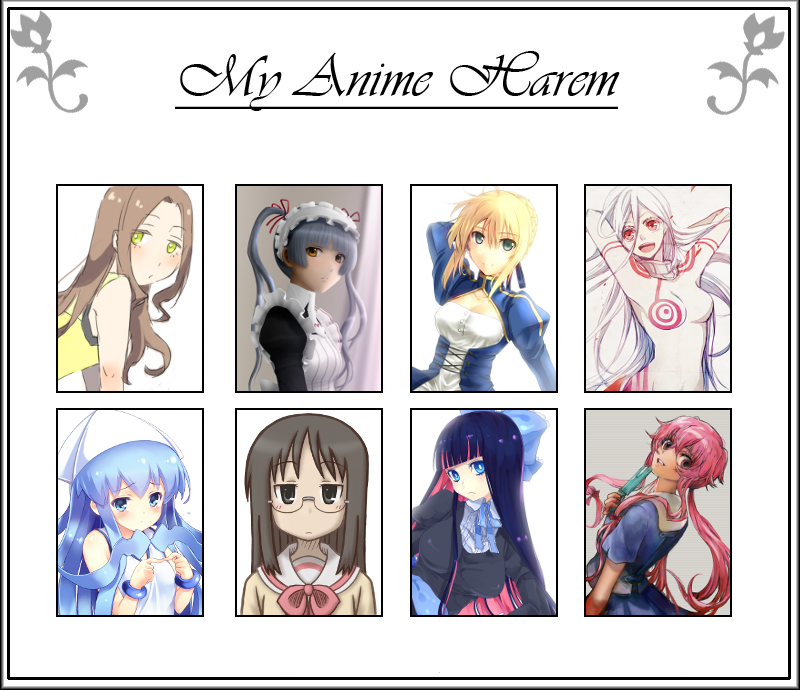 The one thing I did refer to when putting this together was my harem of 2009. I tried to fill the gaps with similar characters, to keep up the same variety I had last year. I’m sure some of my thought processes are more clear than others. 😛 But while it was difficult to find matches for characters such as Nobue, this year has also resulted in some ‘unique’ characters such as Togame.